Q2: How to Programming from Linux. 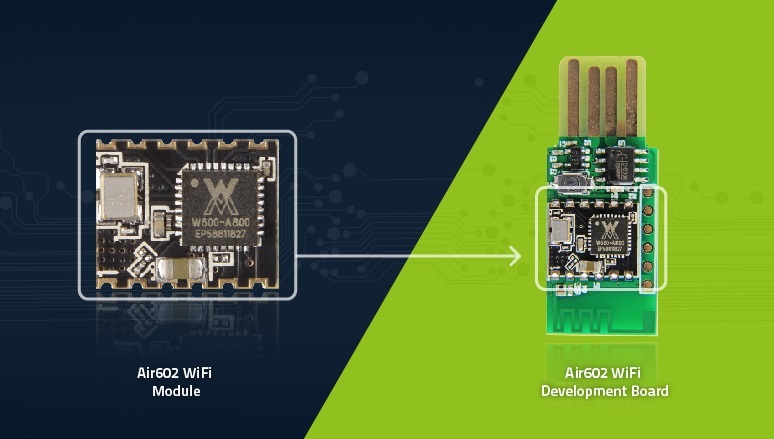 The Air602 module is based on W600 which embedded ARM-Cortex M3, in this tutorial we will show you how to burn the firmware. We provide the official firmware for you. 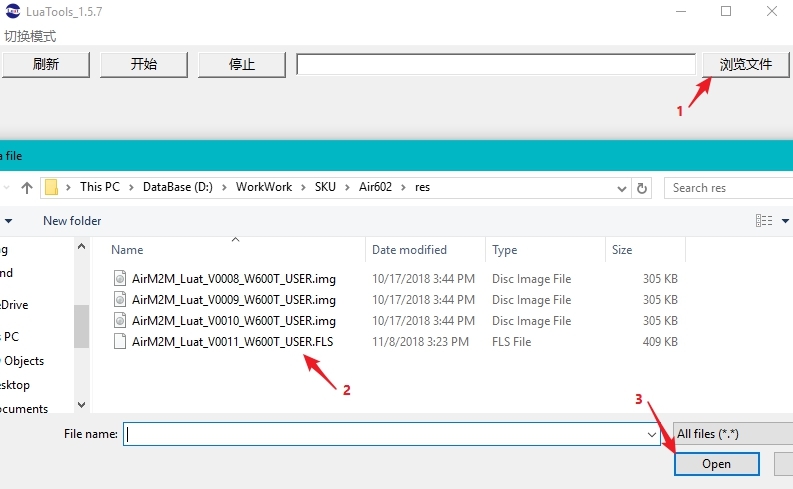 AirM2M_Luat_V0010_W600T_USER Fixed the problem that when the module is set to AP mode and the DHCP function is disabled, the device(stations) still can use DHCP function to get the IP address. At the same time, it also solves the problem that some mobile phones are connected successfully but disconnected immediately. You can jump to Burn the firmware if you do not want to use SDK. Also, you can download the SDK and reprogram it yourself. We recommand you to build it with Keil MDK5. Please use the Keil to open the WM_W600.uvprojx, you can find it in the XXXXX\WM_SDK\Tools\Keil\Project, XXXXX is the location you unzip the SDK. When build is done, you can find the .img file at XXXXX\WM_SDK\Bin, also XXXXX is the location you unzip the SDK. Now you can burn your own firmware to Air602, then the question is how? 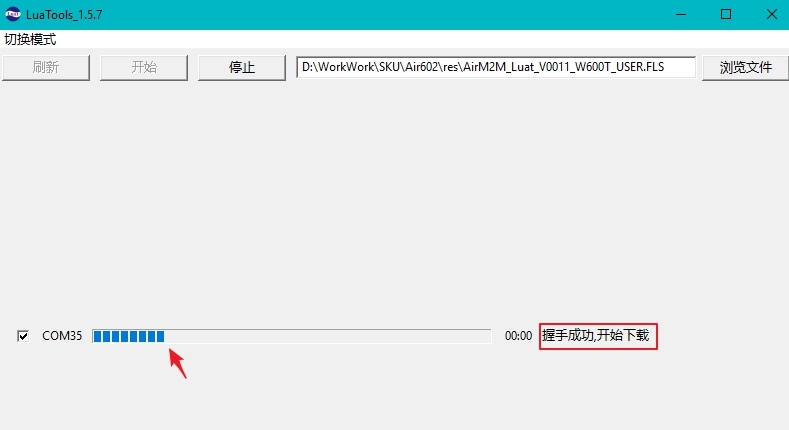 Unfortunately, the firmware tool only support chinese language, to solve this problem, we will show you the sreenshots step by step. Step 1. 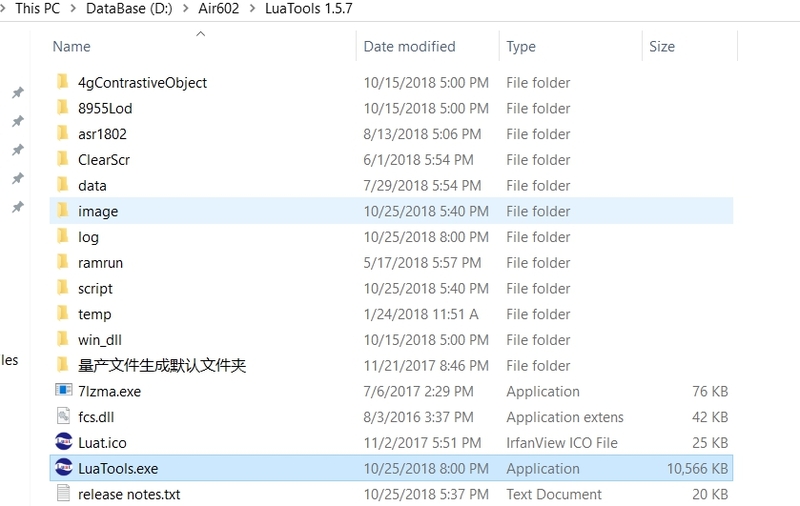 Unzip the Firmware Tool, find and double click the LuaTool.exe in the XXXX/LuaTools 1.5.7, XXXX is the path you unzip the firmware tool(LuaTools1.5.7). Step 2. 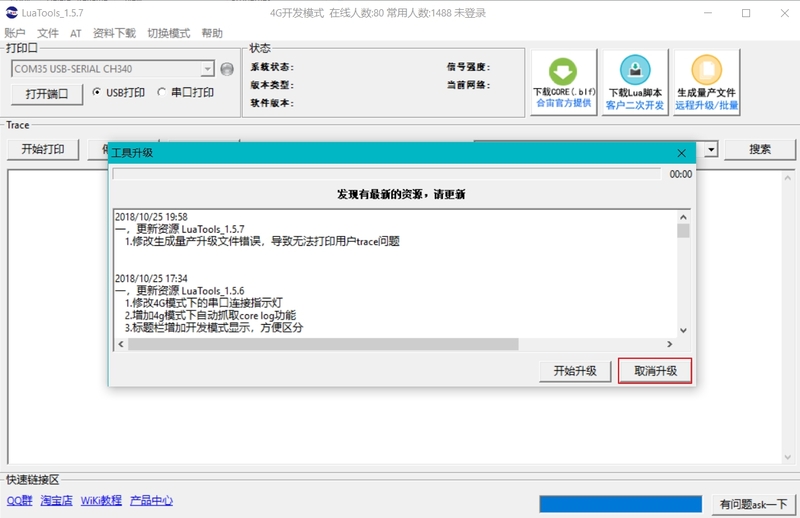 When you opened the tool, it may pop-up a window to let you upgrade, you can just click "取消升级" to pass this step. Step 3. Switch to wifi mode. The default mode is Luat for 4G, to burn the Air602 firmware we should click 切换模式→切换至WiFi. Step 4. Choose the firmware you've just download or build by the SDK. 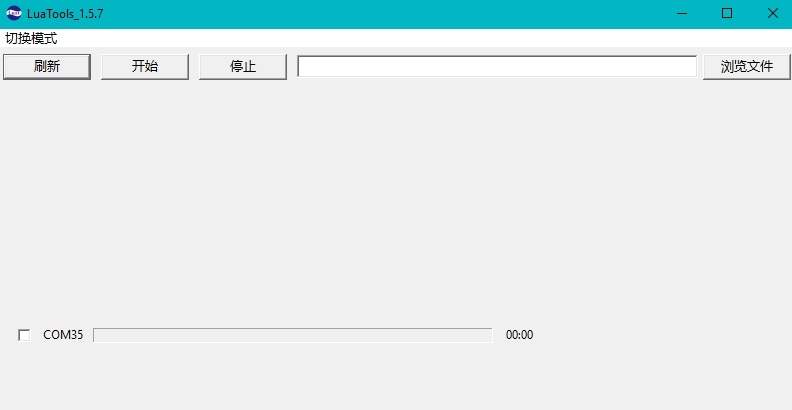 Click 浏览文件, choose the firmware(both .img and .FLS will work), then click Open. Step 5. Choose the corresponding COM port and start to burn the firmware. Actually the tool will detect the Air602 COM port automatically, you just need to tick the check box, then click 开始 to start programming firmware. Then you will see a notice 开始握手，请重启WiFi模块, when this prompt appears, please press the reset button on the Air602 development board in time. Please becareful when you press the reset button to prevent the USB device false eject. Senconds later it will prompt at the same area 握手成功，开始下载, which means successful handshake and the progaramming start. You can also see the progress bar. If it fails, it may show 握手超时, which means handshake timeout, please repeat step 5 several times, it will be OK then. Quote" it seems, that if one burns the AirM2M_Luat_V0011_W600T_USER.FLS Firmware as described in the Wiki, it is impossible to use the LuaTool for that module again. A1: That is beacause the Ver 11 have changed the SDK boot structure, you need to rewrite the flash before burn it back to ver08/09/10. For more detail please check our forum. Quote" Now I find out that the "firmware tools" zipfile does not contain any sources, but just a few windows binaries. So how do I go about programming this thing from my Linux workstation? A2: Unfortunately, we don't have the firmware tool for linux. However you can use the serial port tool with xmodem send function. Step 1. Send 1B (HEX), Cyclically. Step 2. Offered by tarp.andreas. "Try to push the RESET button (or pull down LOW the Res-PIN on the stand-alone module) while sending "\x1b" then you'll get the desired response." For more detail please check our forum. We found that some version of the mac system can not recognize this board. A3 : In that case you may need to install the CH340 driver manually, this board uses CH330N, which shares the same driver with CH340.